Monday, January 28th, 2013. It has been a complete honor to work with GOALS Haiti and their coaches. The progression from Day 1 to now has been remarkable. The first time we visited a Bossian (one of the 4 sites) kids practice on day 1, all we saw was lots of scrimmages. On day 9, we saw the coaches implementing the lessons they have learned from CAC games and the kids’ excitement, work ethic and response was a complete turnaround. Having the coaches pass on the lessons they have learned and seeing everyone so tuned in and engaged was fantastic. 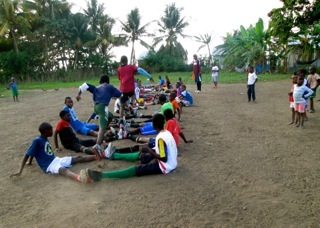 The coaches here in Leogane have come a long way. 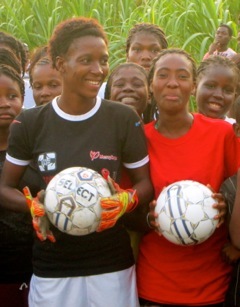 Before the GOALS Haiti and CAC partnership began, they stated soccer as their main focus. Now they recognize that as coaches, they can teach their kids about so much more than just soccer. Yes, of course they can help players reach their goals on the pitch, but more importantly passing on the knowledge and messages they have learned can lead to a better future for each child and for this generation of Haitian youth. On the field, the past few days have been immensely important learning days for the GOALS Haiti coaches. Thursday was our Female Empowerment day, where we played games regarding the rights of women and children in Haiti and around the world. We had passionate on and off the field discussions between the coaches and the CaC staff, where we examined and questioned the cultural and traditional norms. On the final day we gave each coach their certificate of completion. Many pictures and a refreshing Haitian Coca-Cola were preceded by the coaches sharing major points that they got out of the program. We heard responses like “learning how to get everyone involved, Working for ourselves and finding our own answers, Women can do the same thing as men, how to solve a problem, quick thinking, and responsibility.” Many of these things I believe the coaches had in them prior, but we were able to help them unlock those skills and push themselves further. 1. Tim Howard plays for Everton. 2. Check the pasta for ants before you leave the store. 3. You can have an impact regardless of your age, gender, or background. 4. GOALS Haiti is doing amazing things here in Haiti by combining education, community service and soccer. 5. Haiti is a beautiful country filled with amazing people and has the potential for greatness in the future, from within. 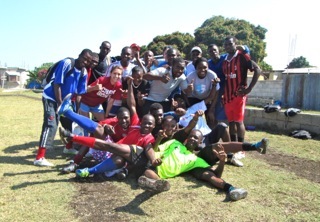 Our trip to Haiti marks the start of Coaches Across Continents’ 3 year partnership with GOALS Haiti. Although we are heading home, work for CaC has not finished. We will design a 24 week curriculum for the GOALS Haiti coaches to follow after we leave. They are of course not obligated to, but have already confirmed that they will and are excited to do so (every Thursday Goals Haiti will run games from the CAC curriculum). We will continue to visit this amazing association for the next two years, and are excited to see the progress we are sure they will make. As we head back to Cambridge, we leave behind a great place and new home as well as many new friends. However, we take with us some life changing experiences and lessons that we may never have learned otherwise. We are so grateful to have gotten to work with GOALS Haiti for the past two weeks. Thanks for everything! Goodbye, Leogane. Previous: Introducing the Community Impact Coach Program!